Recently, I left Vermont and drove over the border to New York. I wanted to take a closer look at a recently discovered barn. 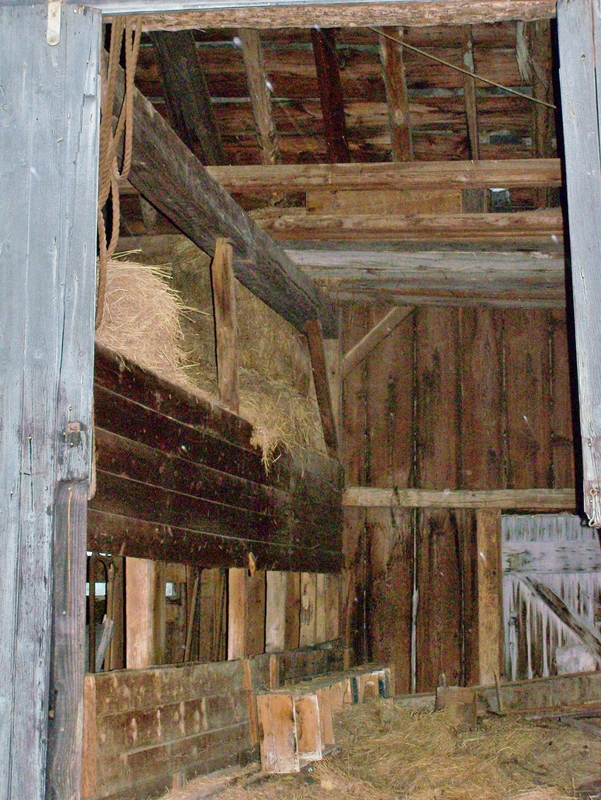 The barn is one in a group of five historic barns in West Hartford. You can see most of the barns on the Available Frames page of my Green Mountain Timber Frames website. The barn measures 22 x 32 ft. and is a “modified gunstock” frame. It has gunstock corner posts with drop girt mid posts. The pictures below help explain what this means. 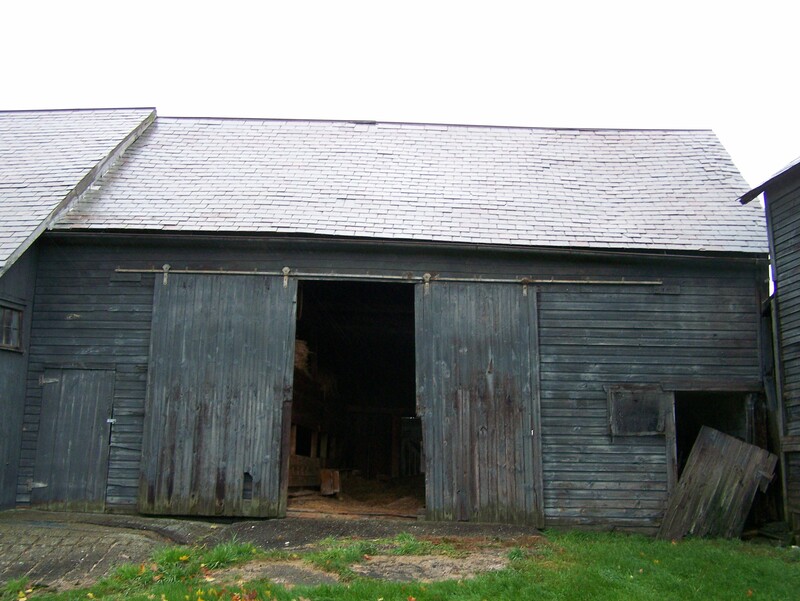 The gunstock style of barn construction was popular before the 1820s. I would estimate that this beauty of a timber frame was built before the 1800s. It features chestnut timbers and the rafters are half-rounds. 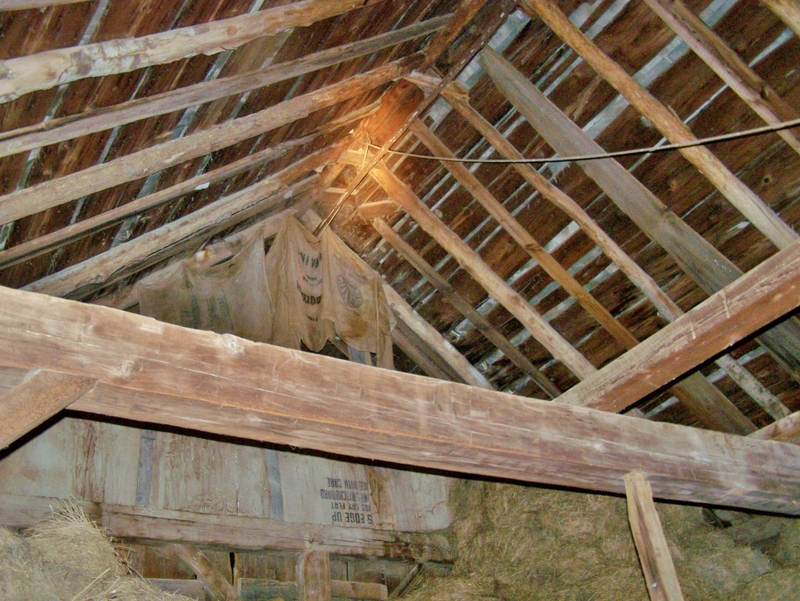 When it comes time to restore this fine structure, we will replace the half-rounds with hand-hewn hardwood rafters salvaged from a late 1700s frame and transform it into a custom home, addition, studio or barn. Here you can see the view from the front. Below is the back of the barn. 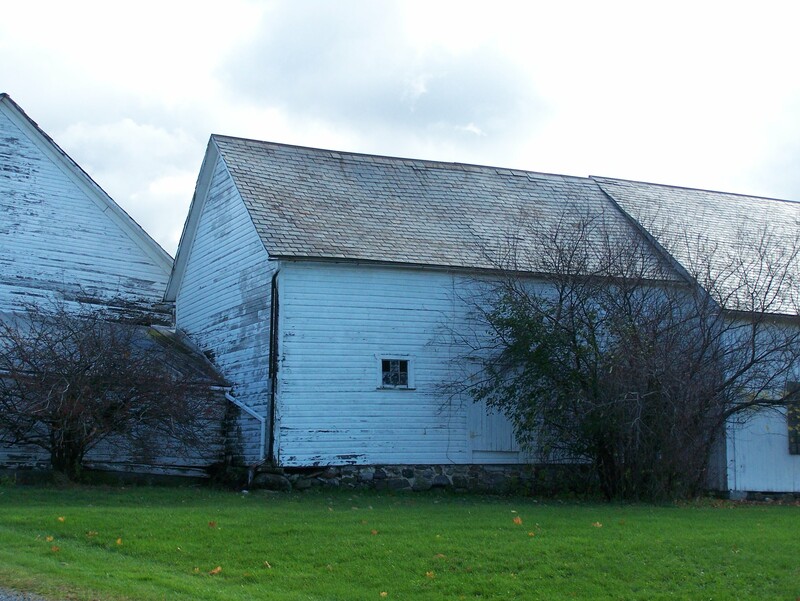 Note how the back side of this vintage barn isn’t painted – a classic Yankee tradition! I guess they were trying to save some money by only painting the side facing the road. 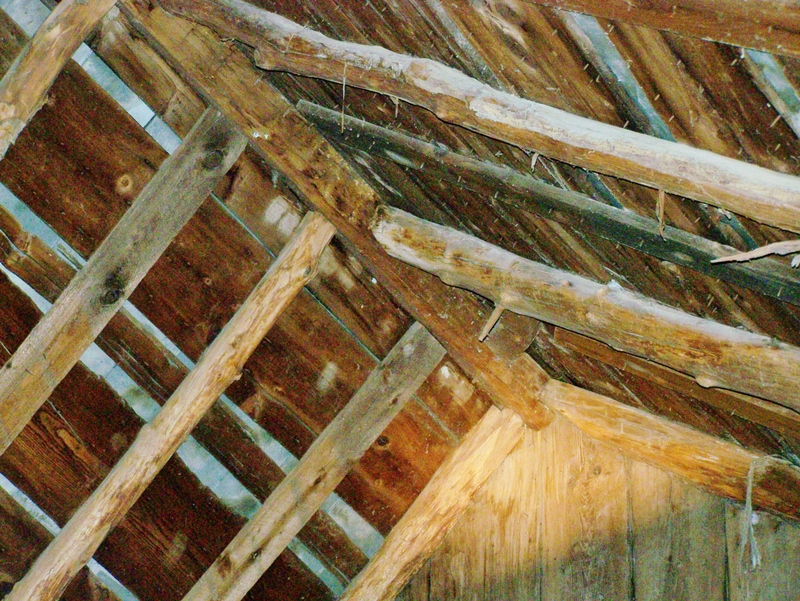 This picture shows the five-sided ridge beam. This style of architecture gives more structure to the roof system. 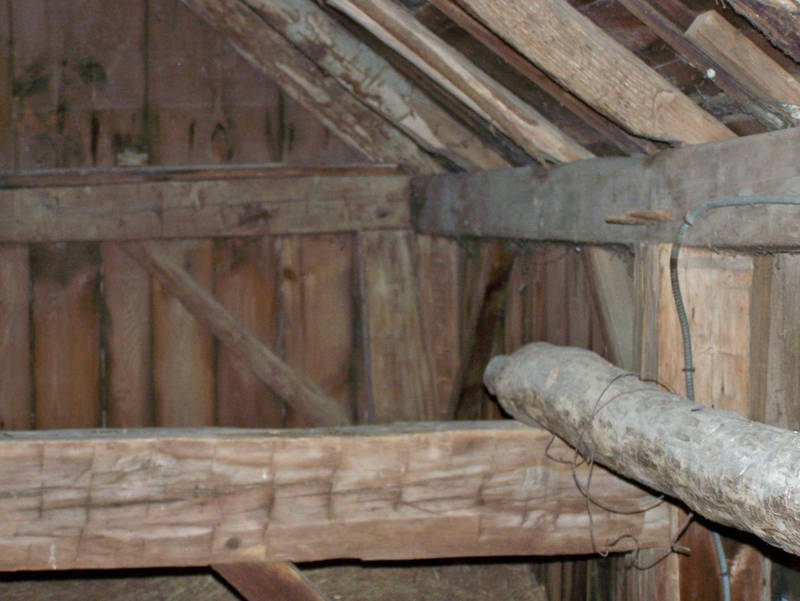 Timber framers stopped using ridge beams after the 1840s. By eliminating them, I imagine it made the building process go more quickly. The rear corner post below is a gunstock post – it’s tapered like the gunstock of a rifle. The nearer post on the right is called a drop girt post – not tapered. (Please ignore the round timber). This is why I am calling it a “modified gunstock frame”. It’s a mystery to me why they chose this combination of styles, using both gunstock and drop girt posts. Perhaps they were trying to simplify the joinery – timber joints. Please let me know if you are interested in visiting this timber frame gem or seeing the other antique timber frames for sale at Green Mountain Timber Frames – we encourage visitors! These strong wooden beams would really make a beautiful home or business space. If you would like to see this frame, or another available timber frame we have in stock, please contact Green Mountain Timber Frames! This entry was posted in Frames in stock, Green Mountain Timber Frames, Post and Beam, Timber Frame Projects and tagged American heritage, barn restoration, gunstock timb, gunstock timber frame, historic post and beam homes, historic properties, historic timber frames, Post and Beam, post and beam homes, timber frame joinery by Green Mountain Timber Frames. Bookmark the permalink.